Great info. I know there were a lot of different signal hands produced over the years. 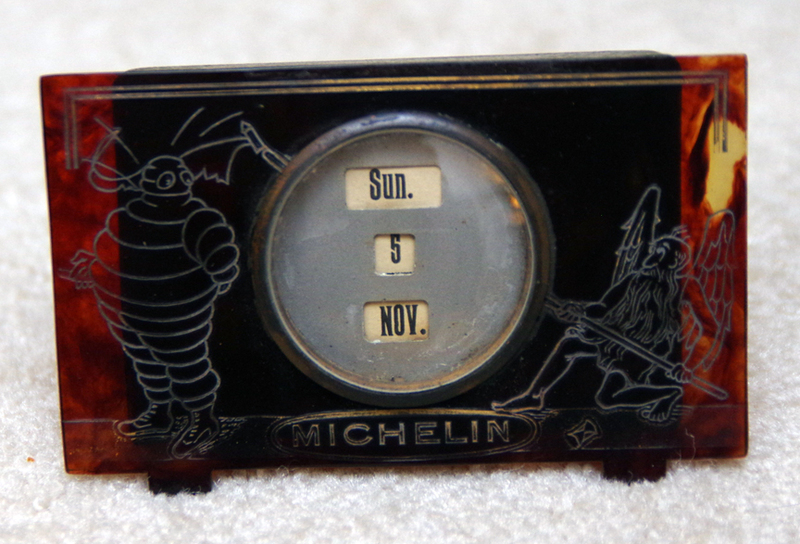 I've got a collection of early auto accessory catalogs and there are several different types shown in them. I wish people still knew what the hand signals meant. 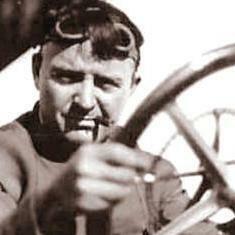 I use hand signals when driving the Model T and most people just wave back at me. 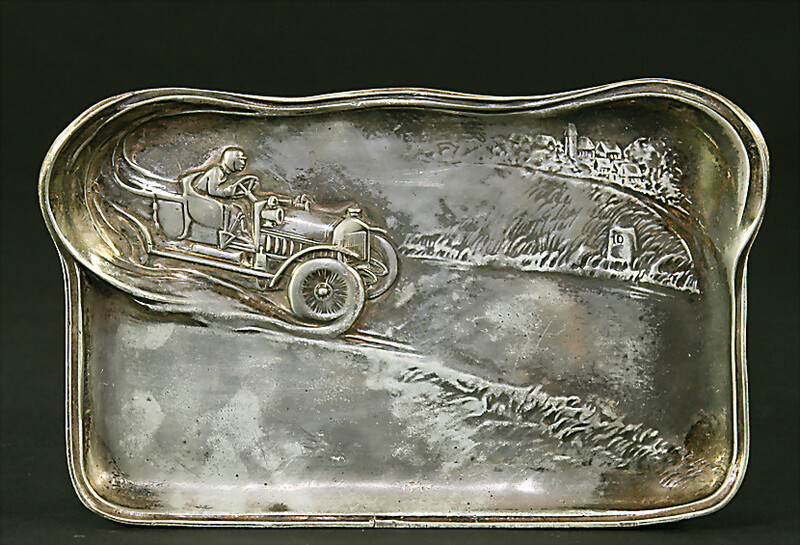 Here are few more trays from my collection as promised earlier. 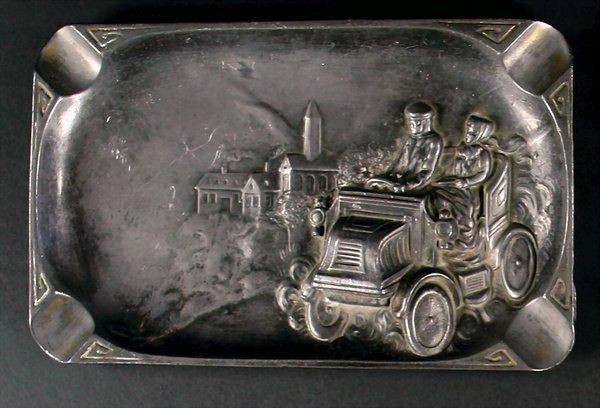 Some were calling card trays. 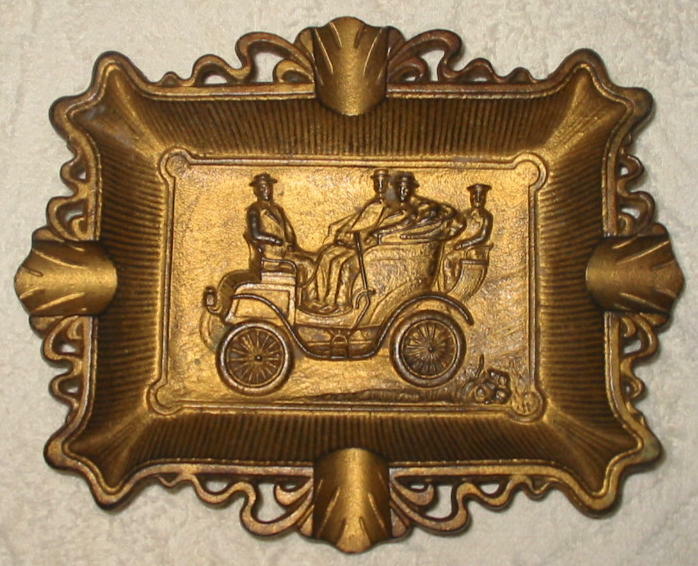 Long before text messages, email or even answering machines and voice messaging, when you called on someone and they were too busy to see you, you left your calling card behind, and for lovers of early motorcars, the tray often depicted an early motorcar or motoring scene. Any others out there? tail lamp that will be going on my HPOF 1920 Buick Coupe. Yours is the only other one of these aftermarket accessory tail light units that I have ever seen. I thought I had the market cornered on them. I looked for a long time trying to find a period correct mounting bracket that would allow the placement of this lamp housing to the license plate cross bar in the middle of the spare tire carrier. I really like the way you showcased your collection. It is very cool to say the least. 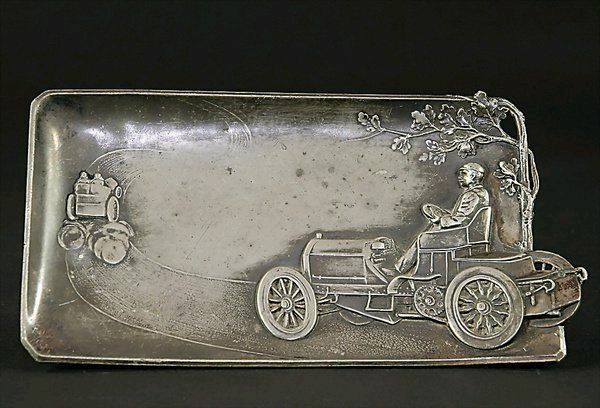 As an additional bit of information about the SLO lens lamp that you and I have - this was a period aftermarket automobile accessory produced by the Culver-Stearns Manufacturing Company in the early 1920's. The Henry Ford Museum has an original advertising brochure about this tail lamp. They made a photocopy of it for me for a very nominal fee and I was quite surprised at the cost back in the 1920's. This light was approaching $10.00 at the time. Thanks for the info. Have not seen several of these before but I know it's become a popular thing to collect over the past several years. I used to pick them up for around $25, most in NOS condition. Now you see them priced at ten times that. Glad I started collecting them when I did. I still manage o find a few here and there. This is a fairly recent acquisition courtesy of a trade with a good friend. I was glad to be able to add it to my collection. It's made by Victor and has red lens on one side, white on the other. Neat piece. I have seen another that has a figure of a policeman on it holding his hand up. Looking for one of those for sure. 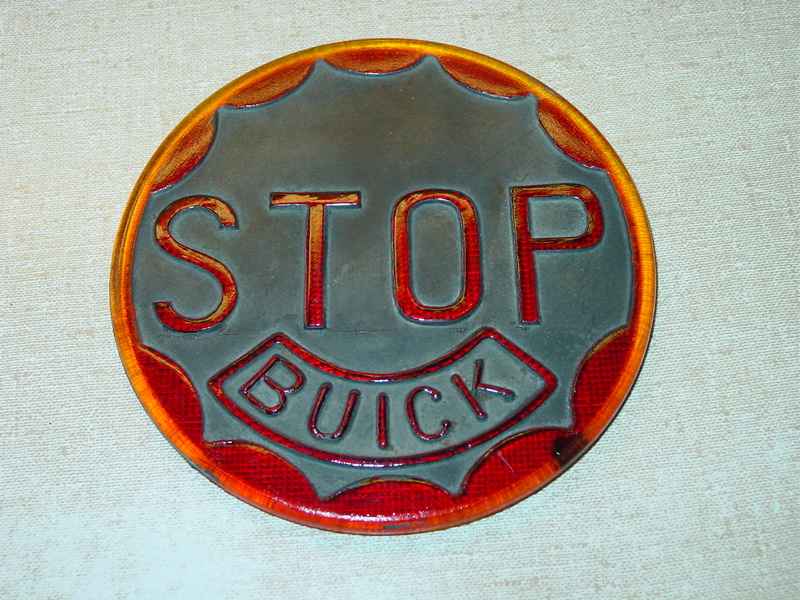 Here is a photo of my 'BUICK' lensed, Culver-Stearns tail light bezel and glass. 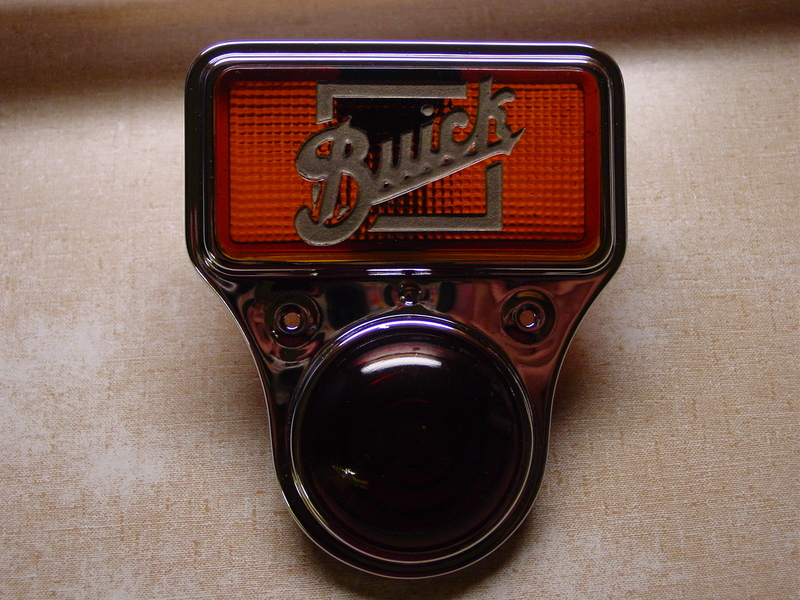 I have also enclosed another photo of an aftermarket BUICK tail light lens that you may or may not have seen. I am into all things early Buick and these things are fun to collect. I picked up this little desk calendar. 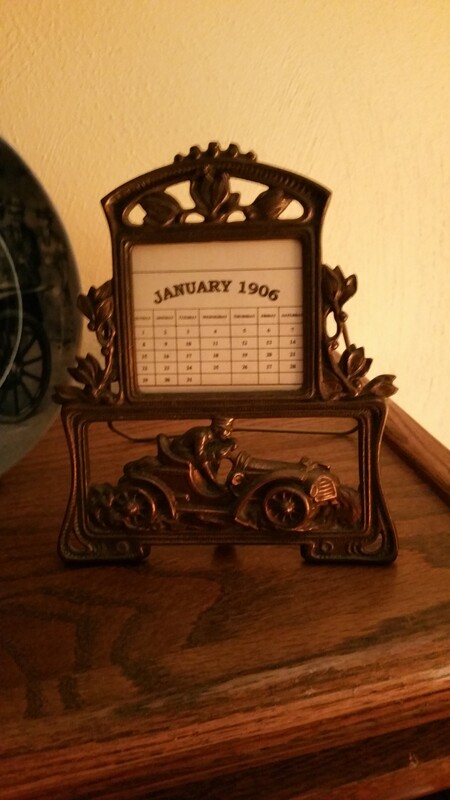 So lets see some of the unique calendars you have out there. One of my favorite calendars. This is part of a desk set that includes folding bookends, letter opener, thermometer, letter rack and even a coat hook. 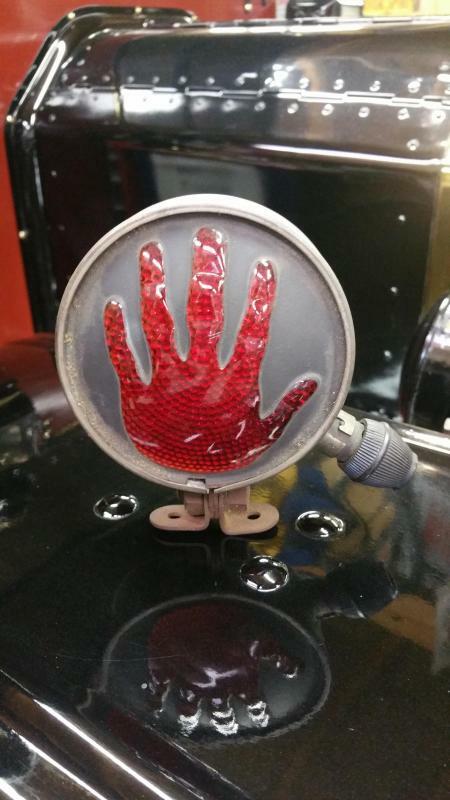 How about this rare Fooey Face stop signal from 1938? The Fooey face is freakin awesome! Terry, can you post any pics of the other pieces of the set? I have not seen another gear driven temp gauge like this one. Neat turn signals. 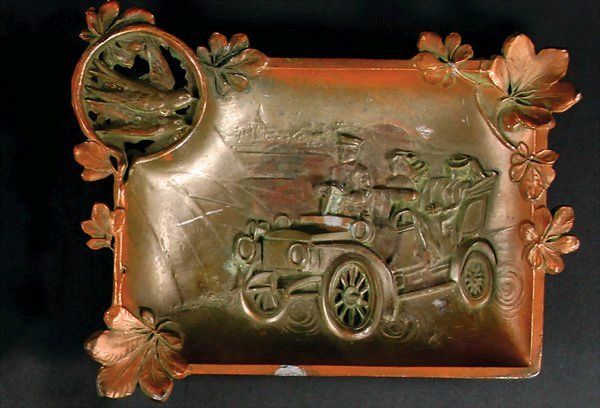 There are hundreds of different varieties of these things and they sure have become popular collectibles in the past few years. Lets talk motometers for a minute. We've all got a few, and my collection is rather eclectic. I've got a few NOS in the original boxes on display in a showcase in my recreated auto parts store but once that cabinet filled up I essentially stopped collecting, except for the occasional chance discovery. I recently snagged a nice Junior Boyce (no car name) in an antique store in NC for $20. I see them all the time on ebay with prices ranging from $50-$500. There are several listed on ebay right now with buy-it-now prices at $350 and above. 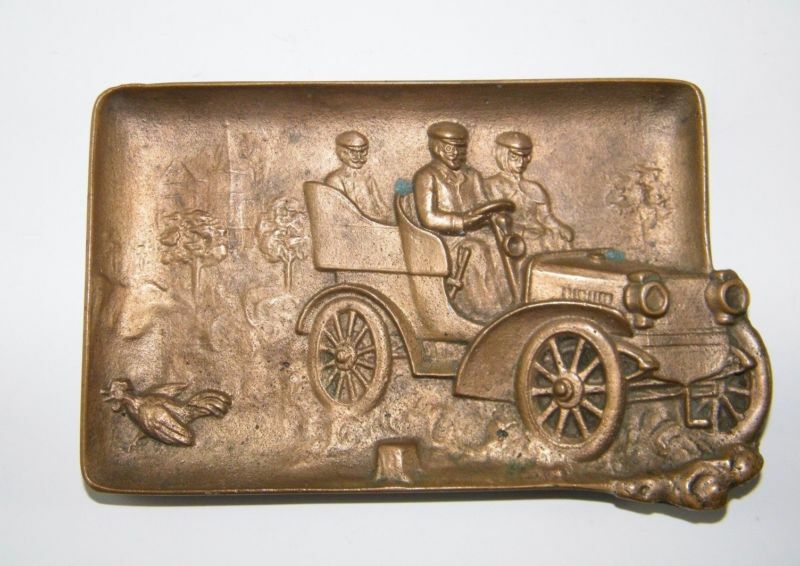 There is nothing special about them and even those with car names on the faceplates are common (Buick, Chevrolet, etc). I'd imagine some of these sellers are just fishing and have no true idea of what they are worth. I've always enjoyed the offerings at Hershey and still see them for what I consider reasonable money. I did buy a nice one last year mounted on a good flip-top dog-bone cap for $125 and thought that was fair and warranted by the very nice condition. I believe the high prices being asked on ebay are not representative of their true worth, but look what it's possibly doing for the casual flea market vendor or antique shop owner who doesn't have a clue and uses ebay to guide in setting asking prices! What are your thoughts on the price of motometers? I know it's always been a "poor man's mascot" but are we facing a surge of "values"? Should we be "investing" in them or buying them now before the prices get so far out of reach we need to turn to collecting other things? Below is a link to what I have on eBay now and in the future. Thanks, Good Luck!!! !